Located in the center of Poznan, near the International Poznan Fairgrounds, the Novotel Poznan Centrum is a modern venue excellent for business and leisure travelers. 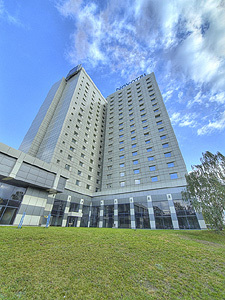 The hotel has the biggest conference center in the Poznan region that can accommodate up to 800 participants. Business guests will find excellent services in the modern Business center. The hotel is approximately 0,5 km away from the railway and the international bus stations and 7 km away from the airport. 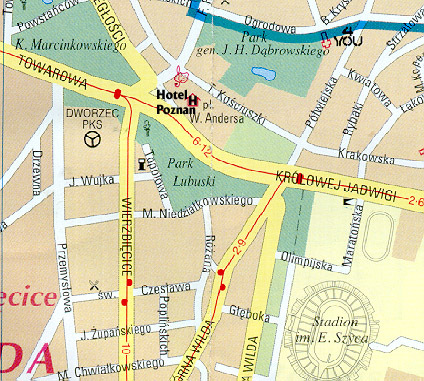 The Poznan Hotel offers 460 air-conditioned single and double rooms, 10 suites, rooms for disabled, rooms for nonsmokers. All rooms are equipped with mini-bar, satellite television, Canal+, radio, direct-dial telephone, bathrooms and alarm clock. There are 4 lifts in the 16-storey building. Pets are allowed. Guests can leave their cars in the underground garage or guarded car park in front of the hotel. 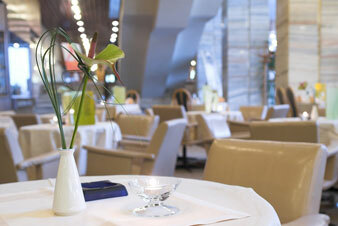 The elegant restaurant serves tasty Polish and European dishes. Room service is available. In the morning guest can choose among breakfast buffet, a la carte breakfast, or early breakfast. Guests can spend leisure time in a nice bar with TV or in reading room. For wellbeing of guests the hotel provides a modern fitness center, sauna and solarium. Guests will enjoy wireless Internet access, and can use the printer, fax and computer. Express check in and check out is available. Guests will enjoy facilities for the disabled, hairdresser, newsstand, jewelers, car rental, laundry service, security system and fire alarm. The hotel offers conference room for 50-600 persons, small rooms for 10-40 persons equipped with A/V devices, copying facilities, fax and internet. For the guests disposal are: solarium, hairdresser, newsstand, jevellery, car rental. 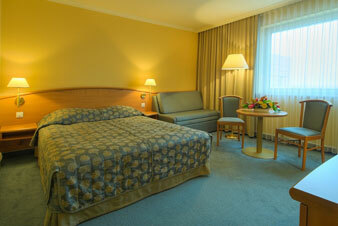 Situated in the centre of Poznan, within walking distance to the International Fair Ground. The hotel offers a pleasant environment for relaxing as well as good facilities for business activities. The airport is 7 km away and the railway station 500 m away from the hotel.